An inventory, modeled on the Inventory of Greek Coin Hoards, enumerates approximately 900 coin finds, chiefly from the United States, but also from Canada and most other countries in the Americas. Also included are about 150 finds of American coins found outside the Americas. Each entry contains the find spot, date of finding, date of deposit, detailed description of the contents, and a bibliography. 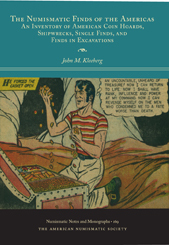 The inventory exploits the numismatic, shipwreck, and archaeological literatures, newspapers, and law reports of treasure trove cases more thoroughly than has ever been done before.